Mankind may be one of the orangutans' closest relatives but humans are also the greatest threat to the orangutans' survival. Clear cutting, forest fires and hunting are reducing orangutan numbers to alarmingly low levels. Never before has their very existence been threatened so severely. Orangutans used to live in many different parts of South East Asia, but the places where they can thrive and find food are quickly vanishing. In Borneo and Sumatra, their last remaining homes, large parts of the old growth rainforest are gone, ripped up for farmland, palm oil plantations and urban development. And the precious little forest that is left is disappearing rapidly as palm oil companies continue to illegally clearcut enormous areas of forest. It's common practice to burn the land before developing a palm oil plantation, and many of these planned fires have spread uncontrollably with devastating effects. Orangutans often die because they can't escape the flames. Trapped up in the forest canopy, they simply have nowhere to go. 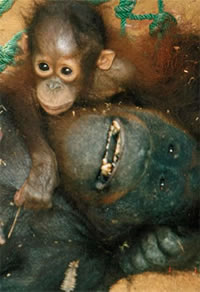 In 1997 and 1998 the islands of Borneo and Sumatra were hit by devastating forest fires. An area larger than Virginia was ravaged and scientists estimate that the deforestation and ensuing drought in succeeding years killed about one third of all orangutans. Many orangutans were killed directly by the fires, but many others were killed by humans. Many of those that escaped the fires ended up on plantations and in villages-- desperately looking for food and protection from the fires. Starving, tired, wounded or sick, many became easy prey for poachers who saw an opportunity to make easy money selling the meat from the adults and putting the babies up for sale on the black market. Mothers were butchered and their babies were plucked off their dead and dying bodies in order to be sold into the illegal pet trade. Hunting orangutans for the black market is a shameful and common practice-- but one that is still all too prevalent. Babies are sold for pets and adults are killed for their meat. The fact that it is illegal to sell, capture or kill orangutans does not deter unscrupulous black marketers and poachers, who know they can make easy money. The standard of living in Indonesia is such that an extra twenty dollars can feed a family for weeks. 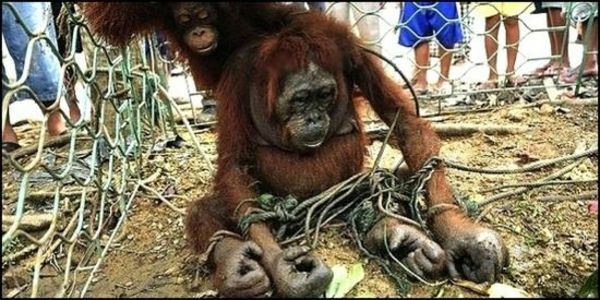 So the temptation to hunt, kill or sell an orangutan is simply too strong to resist. There are many underlying causes for the loss of habitat. It is a combination of economic pressure, greed and ignorance, and natural disasters-- all of which come as a result of mass deforestation. The population of Indonesia is growing at an astounding rate, and with more mouths to feed, forests are being replaced by farms. People and orangutans share the same space and in any conflict between humans and orangutans, the orangutan always loses. The opening up of the forests has made orangutans much more vulnerable to fires, with much highly flammable dead fuel wood laying around. Opening roads also leads to micro-climate changes, impacting fruiting in the forests. Orangutans have more difficulty finding fruit trees, and when food supplies dwindle so does their reproduction. As a result their numbers slowly decline, and local populations become too low for the orangutans to survive in the long term. Orangutans are the largest arboreal animals in the world and they need large contiguous areas of suitable habitat to survive. Roads restrict their movement, forcing them to come down to the ground where they are vulnerable to predators-- especially humans. Conversion of orangutan habitat to palm oil plantations represents the single greatest threat to the survival of the orangutan. Palm oil plantations are a huge problem for orangutans (both in Indonesia and Malaysia), where entire forests are being cut down to make way for the plantations. These large scale palm oil companies clear land by cutting the forest then burning the land to clear it for planting - this contributes to widespread, often uncontrollable fires in Indonesia. 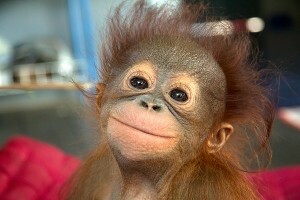 Please help the orangutans today!